Dove Silky Smooth Cookies and Creme - 18 Bars Just $10.79 PLUS FREE Shipping! Just $0.60 Each! 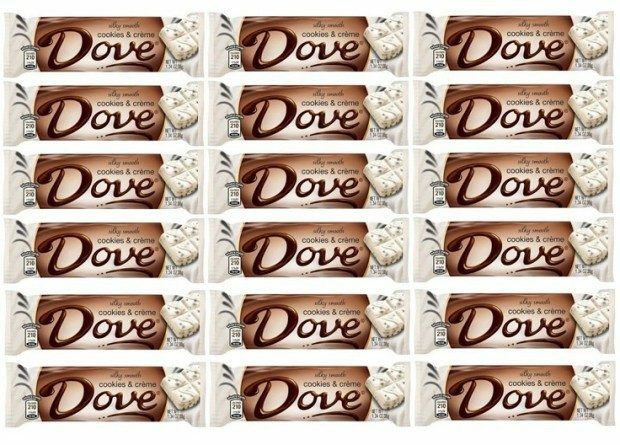 You are here: Home / Great Deals / Dove Silky Smooth Cookies and Creme – 18 Bars Just $10.79 PLUS FREE Shipping! Just $0.60 Each! Dove Silky Smooth Cookies and Creme – 18 Bars Just $10.79 PLUS FREE Shipping! Just $0.60 Each! Dove Silky Smooth Cookies and Creme – 18 Bars Just $10.79 PLUS FREE Shipping! Enjoy a rich Dove cookies and cream bar, with crunchy cookie bits blended with sweet and creamy white chocolate! It’s the perfect combination of indulgence and Dove deliciousness. You can get this Dove Silky Smooth Cookies and Creme – 18 Bar Pack For Only $10.79 PLUS FREE shipping! That’s just $0.60 each! Get yours before I buy them all!